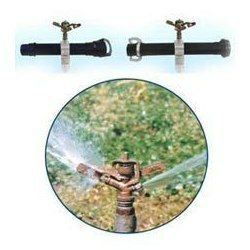 Our clients can avail from us, a wide array of Sprinklers Pipes that is widely used for plumbing purposes like supplying water connections to bathrooms, kitchens and transportation of chemicals & gases in industries. These are designed in compliance with international quality standards and can easily bear high pressure. Our clients can avail from us, a comprehensive range of Sprinklers Pipes Fittings that is manufactured using premium quality material. In our range, a color clamp spin on collaring nut bolt and, with the help of lock system, gives easy connection & disconnection. The tail piece and couplers are welded with the pipes and are available in various sizes and designs.